The all new Greensmaster® TriFlex™ Hybrid Mowers were designed to take precision cutting on a hybrid mower to a completely new level. Adopting the proven Flex suspension, the cutting units float freely over contours and undulations of the green resulting in a superior quality of cut and aftercut appearance. Improved serviceability is another major advantage of the new TriFlex™ models. The tool-free, quick-change cutting units make servicing the cutting units fast and easy and a lift-gate footrest provides easy access to the center cutting unit. The all-electric reel drive eliminates hydraulic leak points and delivers ample horsepower to handle a broad range of cutting applications. The TriFlex™ Hybrid models address customers’ environmental and financial needs with a combination of features that save energy, enhance productivity, extend a product’s versatility, and enhance turf health. 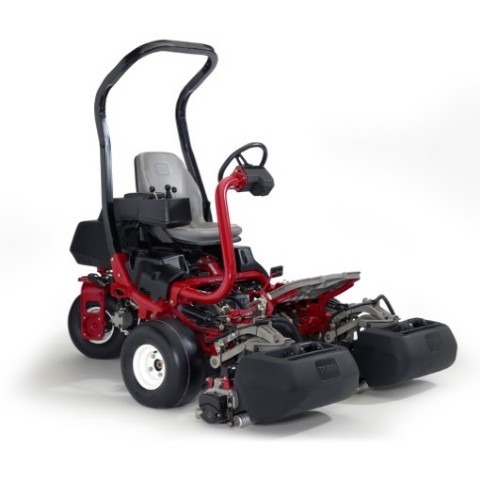 These innovations combine – making the TriFlex™ Hybrid the first product to earn the EnergySmart™ label from Toro. Easily customize clip for different heights of cut and adjust other operational settings to gain complete machine control. Common operation information displayed includes: reel speed, hours of function, system voltage for reels, diagnostic descriptions, and much more. Maximise fuel economy to improve cost of ownership. With more than enough horsepower and highly efficient components, the TriFlex Hybrid models operate efficiently in energy savings mode. 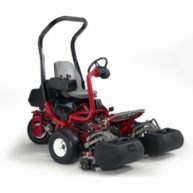 While in this mode, engine RPMs are reduced and the all-electric reel drive maintains a constant reel speed. This results in reduced fuel consumption and noise while maintaining quality of cut, performance, and productivity. Sealed Electrical components for worry-free wash down. The electrical connectors and components are completely protected permitting machine wash-down without worry. In addition to eliminating hydraulic leaks, each reel motor has a nominal 1.5 horsepower (1.1 kW) that can increase up to 3.0 hp (2.2 kW) during peak load periods. This translates into the power you need when you need it for unparalleled performance in your most challenging cutting or verticutting applications. Eliminates clip marks at startup of mowing path and provides braking power to stop reels from spinning when cutting units are disengaged for safer operation.